With the new changes and improvement in Windows 8, more and more tips and tricks you should grasp in order to have a good experience of using Windows 8. This article will make you know how to delete your application history in Windows 8. 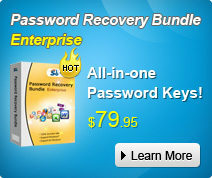 As for other tricks for cracking Windows 8 password, you can choose Windows Password Recovery to crack it easily. When you close a Metro application in Windows 8, it’s more like it gets paused, rather than completely closes. This allows us to quickly switch between applications without having to launch the application history as well as exit any application from scratch. 1. Press the Windows + I key combination, when the sidebar appears go ahead and click on the “More PC Setting” section. 2. When the new “Metro Control Panel” loads you’re going to want to head over to the General Section. 3. On the right-hand side, a simple click of the Delete button in the App switching section will do the trick. 4. If you take a closer look at Task manager you will also notice that it closes any 3rd Party Metro applications that were running in the background. 5. Of course, it also removes them from the application switching list, as promised. Thus you have learnt how to delete your application history on Windows 8 successfully. I had the pleasure of operating with MH for 3yrs whilst attending Suny. What an incredible man and pal. MR HARRIS FOR PRESIDENT 2016!! !